Prime Minister Sheikh Hasina has stressed the need to strengthen the stock market to fund big projects, report agencies. "I urge everyone related to the capital market and the BSEC to ensure investors' security and enhance the role of the capital market in implementing the big projects to accelerate economic growth," she said. In her speech Prime Minister suggested undertaking seven-point measures for stock market development. 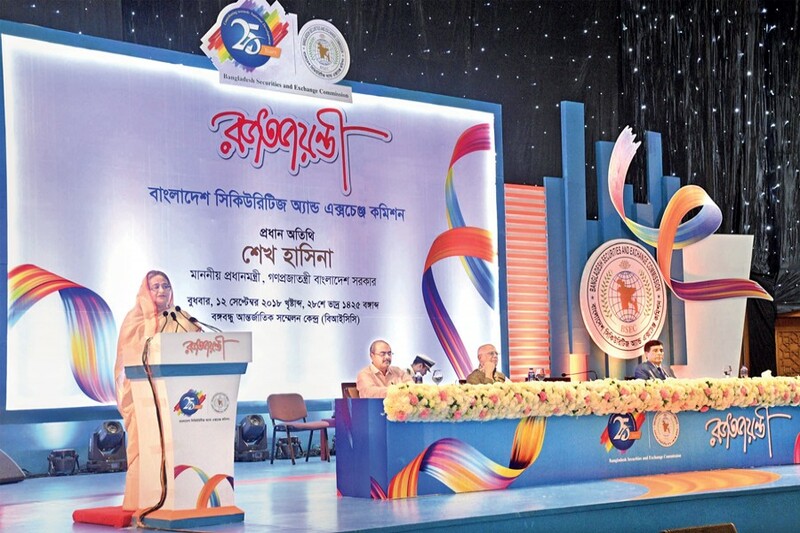 Hasina also called upon the small investors not to get tempted by others while investing in the capital market but take their own decisions after knowing everything about a company. "I am sure the economy will develop further through the investment in the private sector once these programmes are implemented," the prime minister said. "I'll request you to know in detail before you invest in any company. We never want anyone to bear any financial loss after investing in a company," Hasina told retail investors. "We have continued to provide our assistance to develop the capital market, one of the pillars in our economy and it has reached a stable position today. Globally, Bangladesh is now known as a fast-growing market with a lot of potential." "BSEC has received the honour of being category 'A' regulator and foreign investment has increased due to our actions. India, China and other countries are showing interest in our market." The prime minister expressed the hope that the memorandum of understanding signed between the regulators of India and Bangladesh and the Chinese consortium becoming the strategic partner of Dhaka Stock Exchange will increase the 'depth' of capital market and will benefit investors and other stakeholders. "No law or any book of rules existed for our 25-year-old agency before 2011," said Finance Minister Abul Maal Abdul Muhith. "Now in 2018 we can feel contented with our market. The development can't be stopped anymore," said Muhith as he recalled the legal amendments after the collapse in the market.